Sadio Mane nabbed a brace, while Mohamed Salah and Daniel Sturridge were also among the goals. 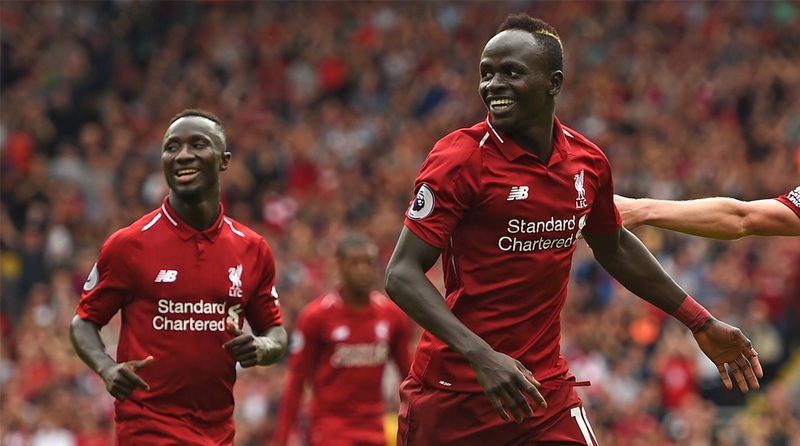 Liverpool stormed to the top of the Premier League with a crushing 4-0 win over West Ham United in their season opener at Anfield on Sunday. Mohamed Salah, last season’s top scorer, picked up where he left off as he took only 19 minutes open the scoring as he tapped in Andy Robertson’s low cross to get the hosts up and running. Naby Keita, on his debut, was running the strings in the middle of the pitch and the Reds were utterly rampant in the first-half with the Hammers barely getting a sniff of a chance. Sadio Mane would double their lead right at the end after some good work from Robertson and James Milner and truth be told, the Reds could have been 3, 4-0 up at half-time. The Hammers, who’ve strengthened significantly in the transfer market, had just one chance of note when Joe Gomez switched off and allowed Marko Arnautovic a glimpse of goal, but the Austrian dragged his shot wide from an angle. Post the interval, Liverpool’s tempo dropped a fair bit but they remained in control and despite the half-time introduction of Robert Snodgrass, Mauricio Pellegrini’s men struggled to test Alisson in goal. Mane would then get Liverpool’s third in the 53rd minute itself, albeit from an offside position and the icing on the cake was substitute Daniel Sturridge’s strike. The injury-prone striker scored with his first touch of the tie, taking advantage of some slack defending on a corner and it may be early days, but Liverpool have fired a warning to the rest of their title rivals. Especially considering Fabinho didn’t even make the bench while skipper Jordan Henderson was only fit enough for a second-half cameo. Klopp’s men next face Crystal Palace on August 20, while the Hammers will have to pick up the pieces before hosting Bournemouth on August 18.